Well, we had a major parenting victory last night. 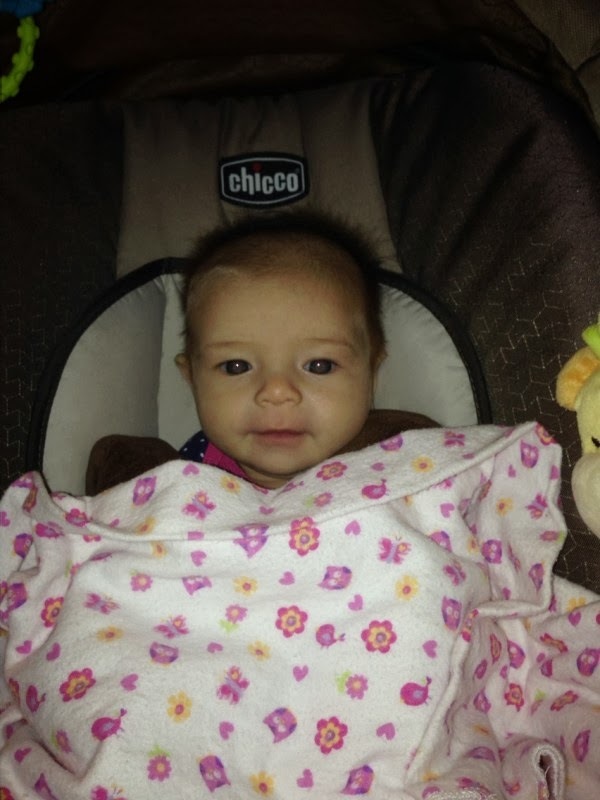 Miss Addison Rose slept through the night for the first time. I fed her around 8:45, laid her down about 9:30, and she didn't wake (save a little bit of fussing every now and again that was in her sleep, I think!) until I woke her at 6:15 to get her dressed and fed to go to school! On one hand, I am super excited. If we get into a habit like this, I can start working out in the morning again (!!!). On the other hand, I admittedly felt a little bit sad. My Baby Addie is getting bigger. Also, holy moly... That is the longest I have gone without feeding. As soon as I got ready to feed Miss A, we were like drip, drip drip... Ha! So here is my gal this morning as we were packing up and getting ready to go to school. Ok, so that is enough on a daily Addie update. I promised myself I would not be a blogger whose sole focus was her children, so we can do a little update and a picture of the cuteness, and then, we move on. As you all know, I have been battling with my head lately. I am not sure what I want. I don't know how to make that happen, as I don't know what I want. Things have been really tricky for me, and I am struggling to find my footing on the delicate balance that is happiness for me. Addie is a great kid and I love her so much more than I thought I would love a baby, any baby, but I still need my Emily things so much in order to stay on top of my game for this little girl. She is not the end all, be all of my existence, and I cannot take proper care of her without taking proper care of myself. This encompasses me mentally and physically, especially right now when what I am doing physically directly affects her (since I am her food source). Mentally, I need to work out for my sanity. It is what keeps me balanced. It is what keeps me off medication, literally. But recently time and exhaustion have definitely gotten in the way of that recently. And I have been struggling mentally. I do not feel my best recently. I do not feel like I am on top of my game anyway. I really would like to be stronger, feel better, etc. I miss the way that running makes me feel. I miss how it made me forget when things are stressful and overwhelming. Lifting definitely did the same thing for me. Physically, I miss what my body used to be, what it used to do. I loved that it could run a marathon. I loved that it could lift heavy. Hell, I loved that I could do a plank with my arms completely straight instead of a lopsided one that I have to do now. My life is different in so many ways beyond the fact that I have a baby to care for. I won't ever be as strong as I once was. I do not think I am going to get 100% mobility back to my arm. Not to mention the fact that I used to look better than I do now, I am definitely still soft. I need to figure all of this out... I am stressed out.